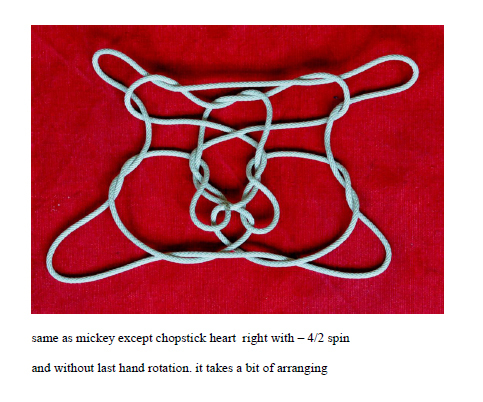 One of my favorite figures was the chopstick heart. 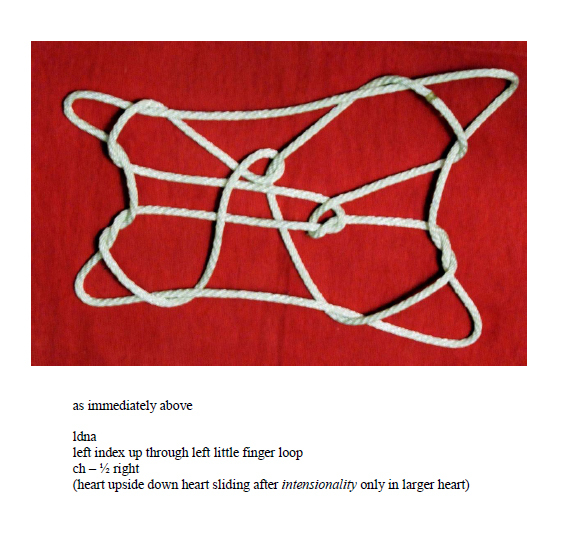 it was called that because I chanced upon it one day while my fingers were thinking for themselves; and I knew immediately I would have difficulty reconstructing it once it was disentangled. 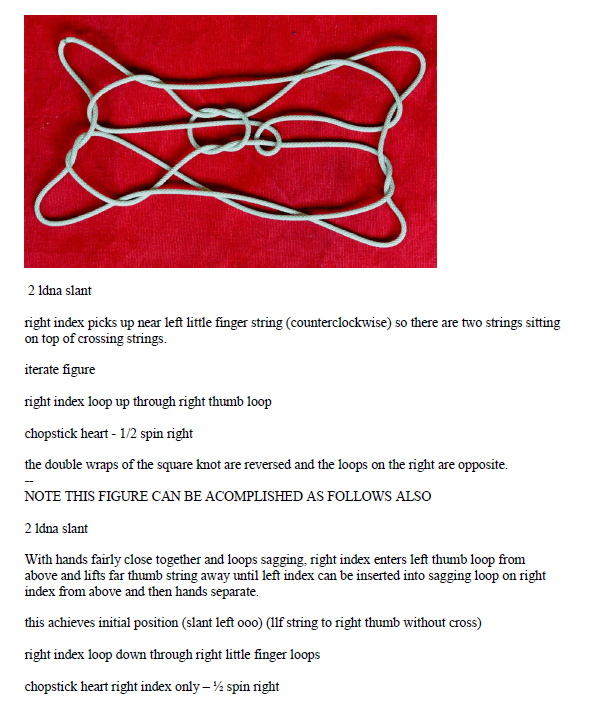 So I hung it on the light fixture above the kitchen table held up by a chopstick. 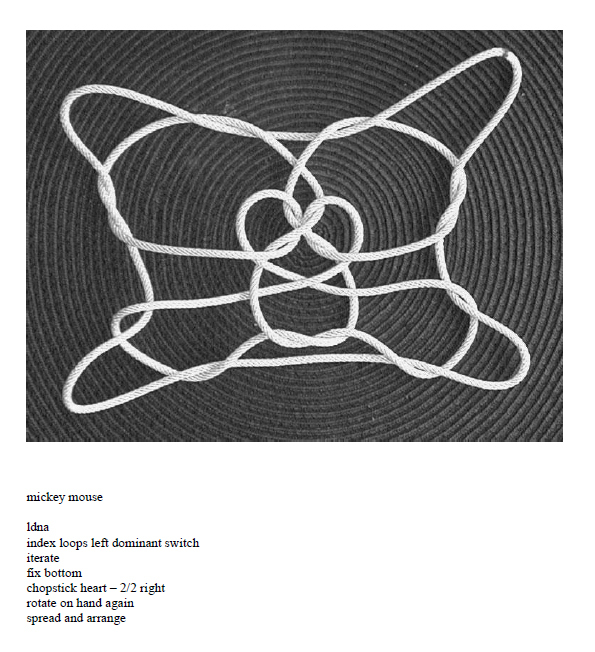 It took quite some time (and only with Mark Sherman”s help) before I finally was able to replicate its exactitude. 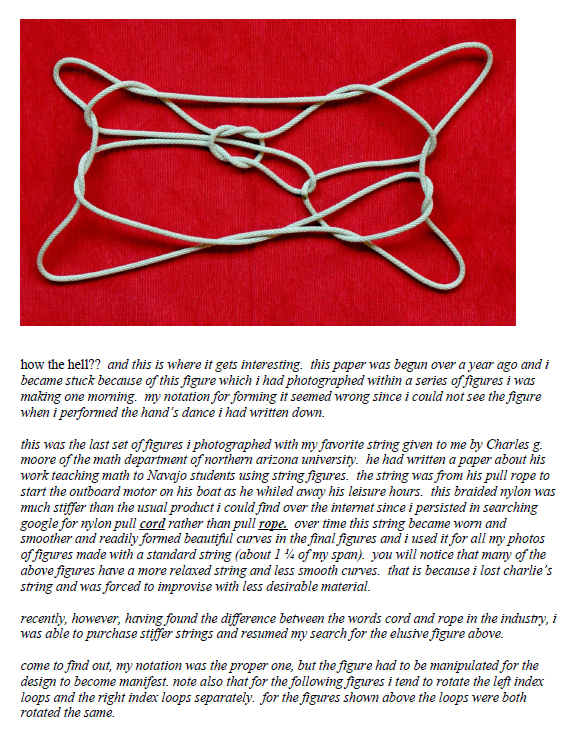 Using what I had learned from the experience I went on to formulate several additional figures of interest. 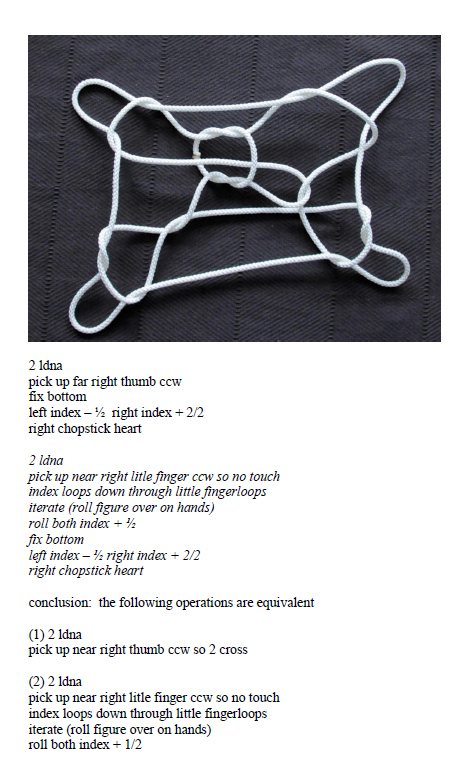 the following paper resulted from investigating my chopstick heart figure using aspects of all twenty openings described above. 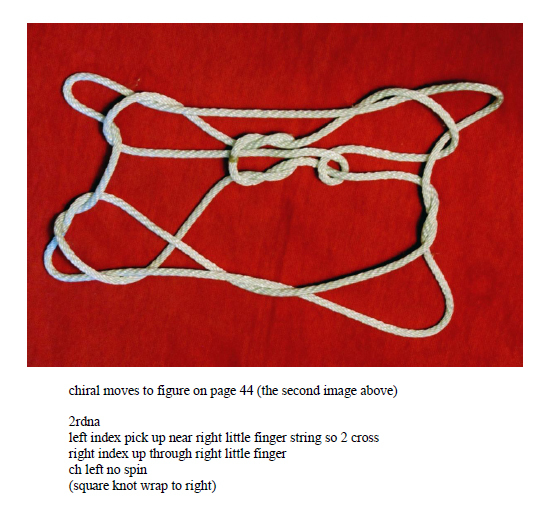 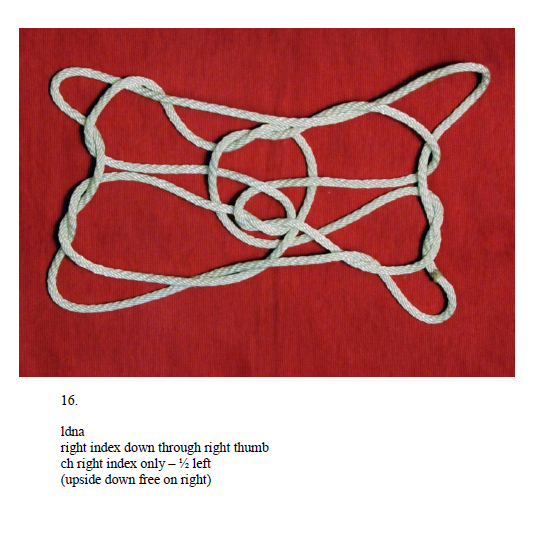 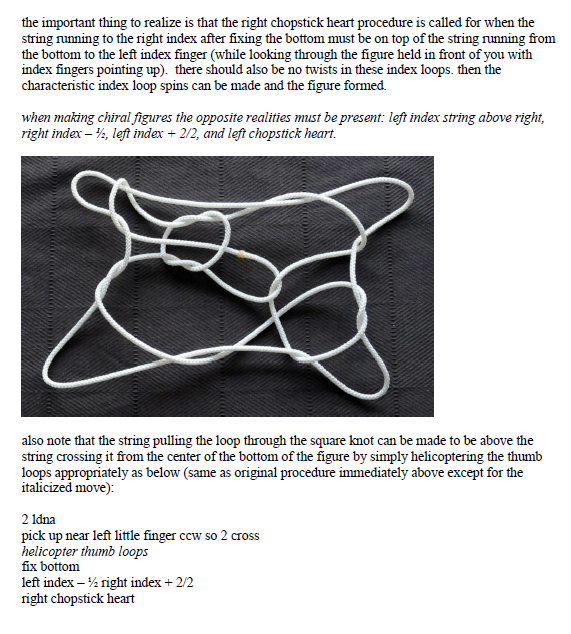 particular interest is given to the chiral nature of string figures and how they are subtly different in their complexities. 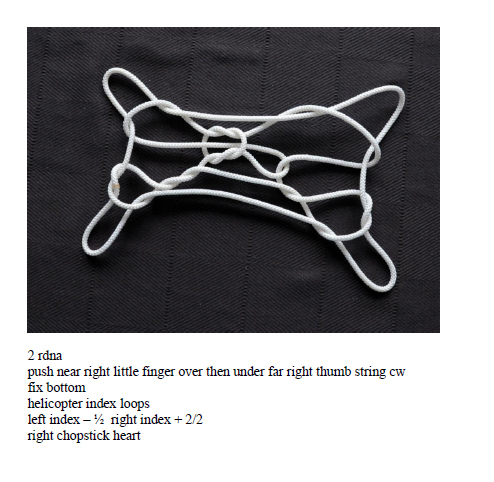 learning how to use chirality to form more stable figures is an important lesson to learn from this paper. 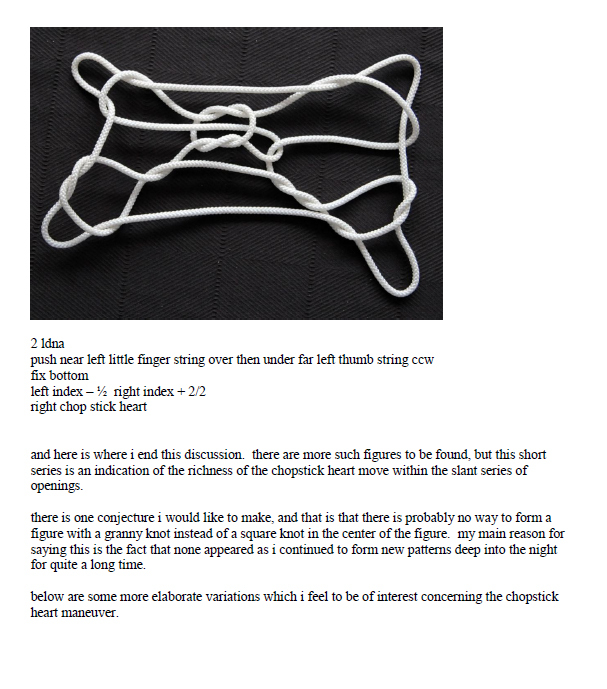 another is realizing that mirror image figures are always available to make. 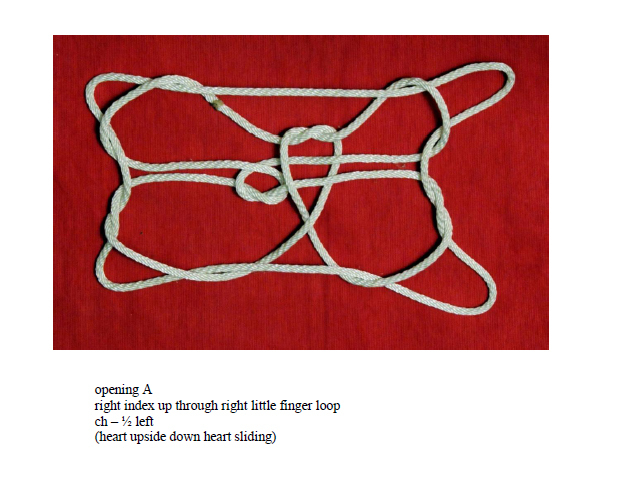 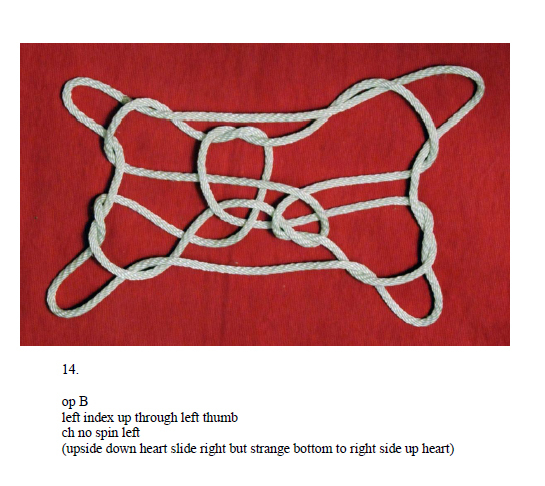 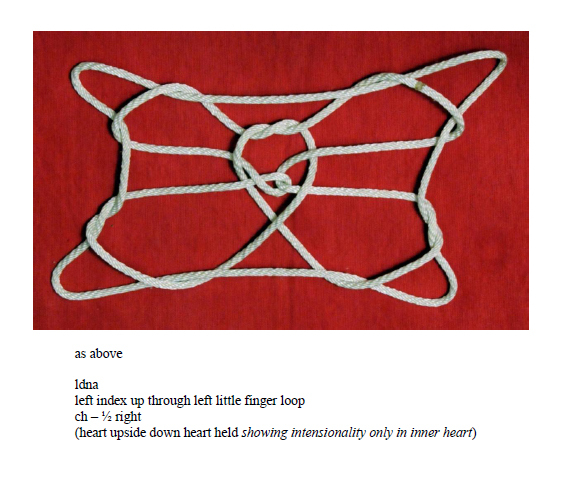 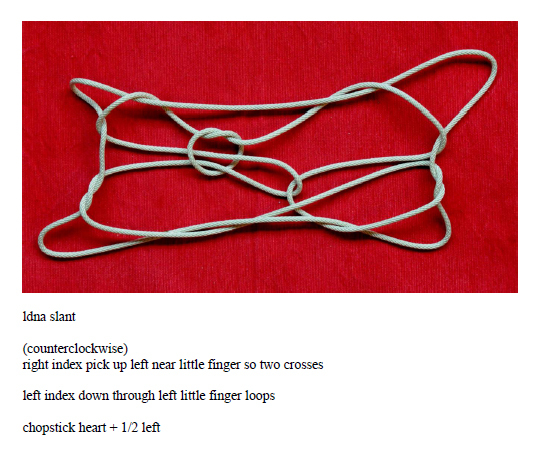 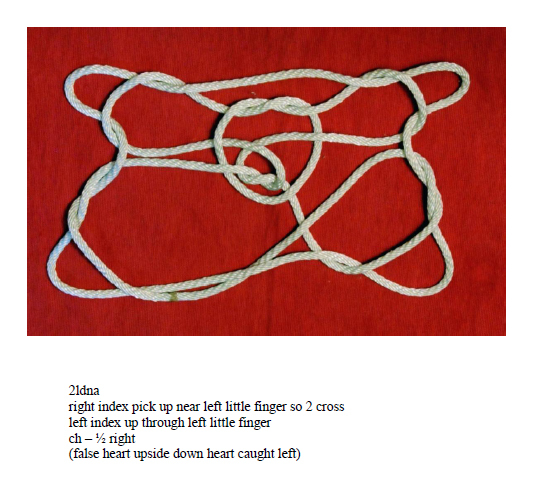 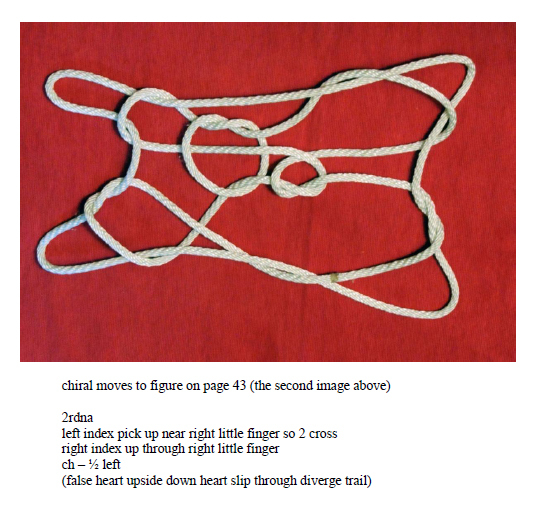 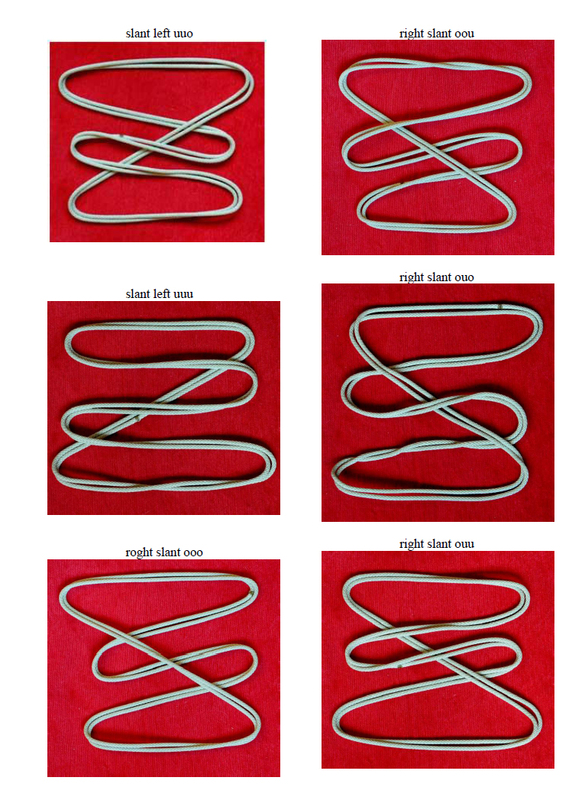 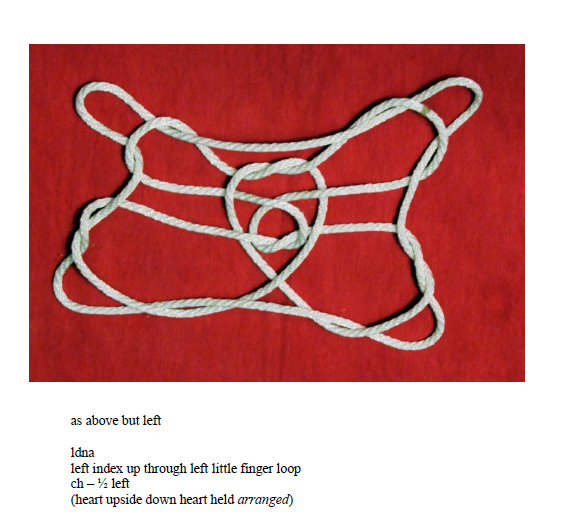 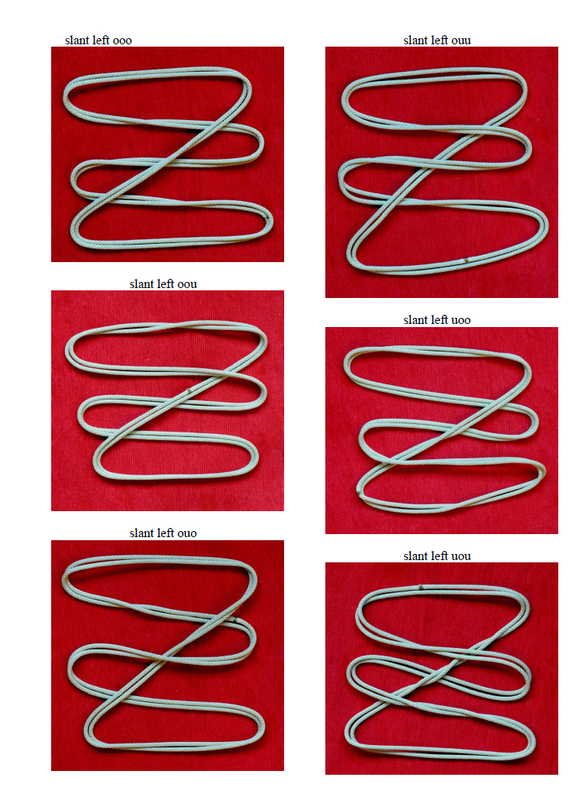 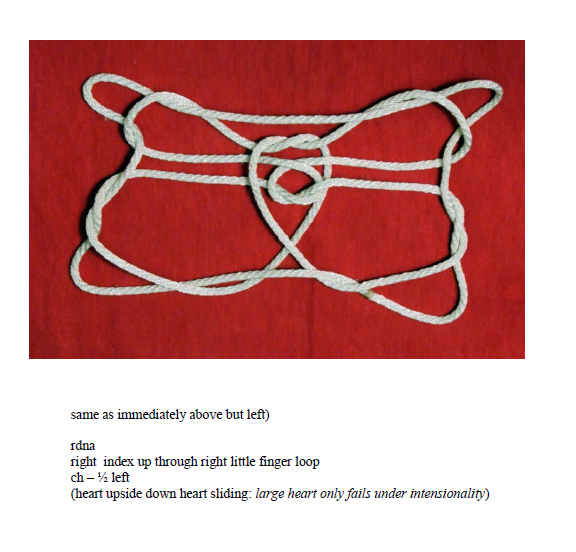 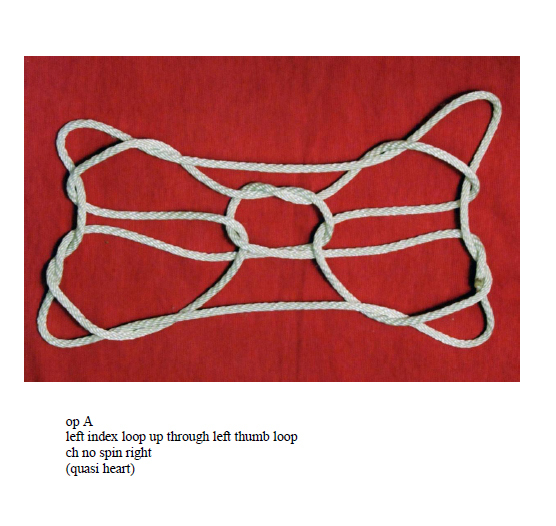 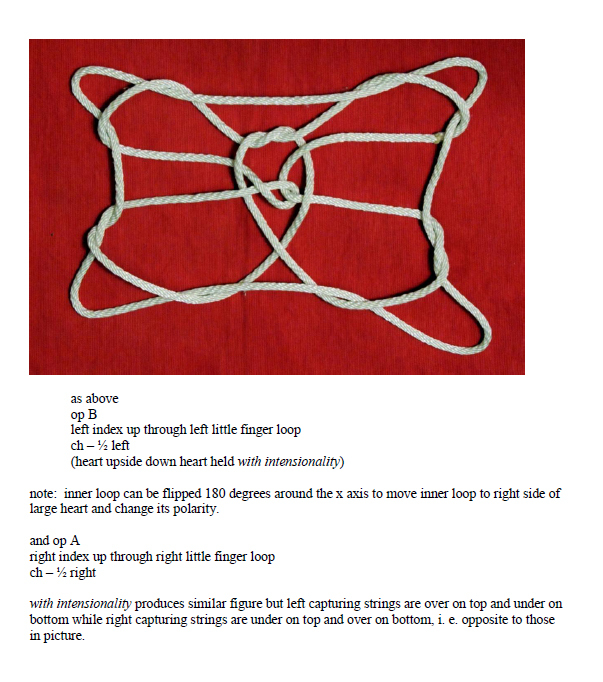 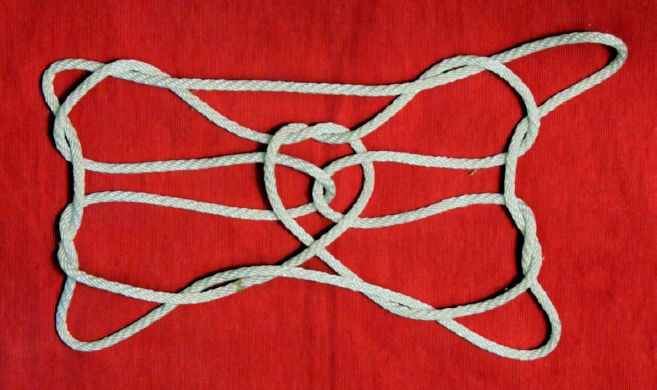 CHOPSTICK HEART MOVES (The following complex maneuvers will be abbreviated as ch – ½ right. 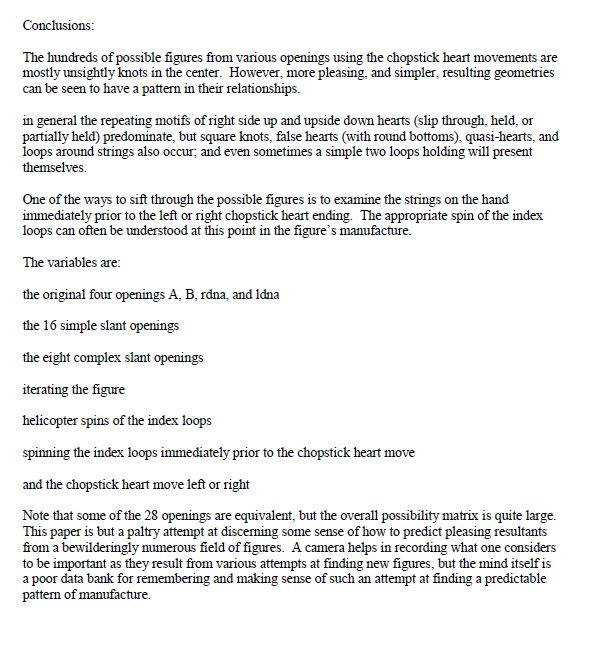 note that the particular move after rotating the index loops may be led by the left hand and be done in a chiral fashion denoted left. 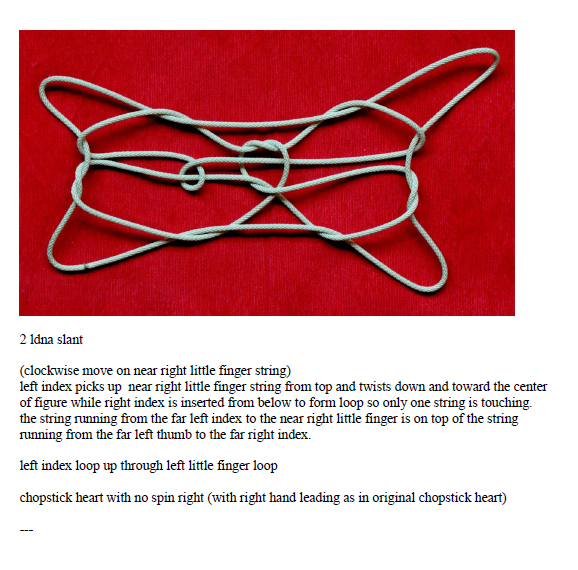 and the index loops may or may not be rotated in either direction singly or as a pair. 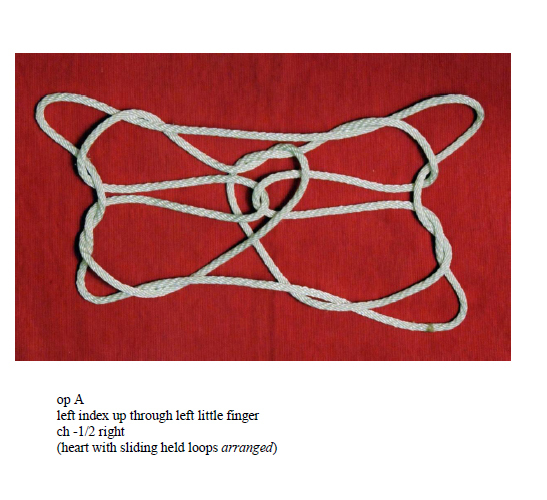 Without withdrawing the middle finger from the lesser fingers loop, pass each middle finger toward you under the index loop and insert it, from above, into thumb loop; curl the middle finger around the far thumb string and draw it away from you through the lesser fingers loop; withdraw the ring-little fingers and close the middle finger to the palm; reinsert the ring-little fingers into the middle finger loop, closing the far middle finger string to the palm. 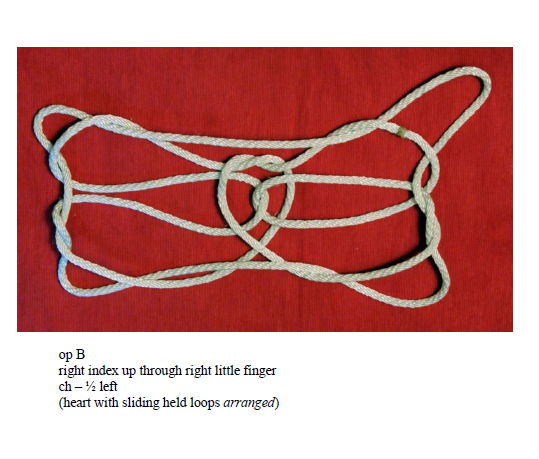 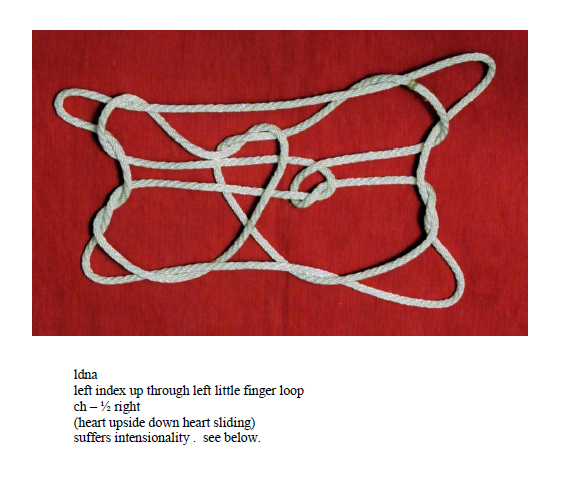 Near each middle finger a loop surrounds the palmar string of each hand; the loop has an upper and a lower string (the latter being a transverse string); pass each middle finger toward you through this loop, then curl the middle finger around the lower string, drawing it away from you through the ring-little finger loop; drop the ring-little finger loop and reinsert these two fingers into the middle finger loop, closing the far middle finger string to the palm. 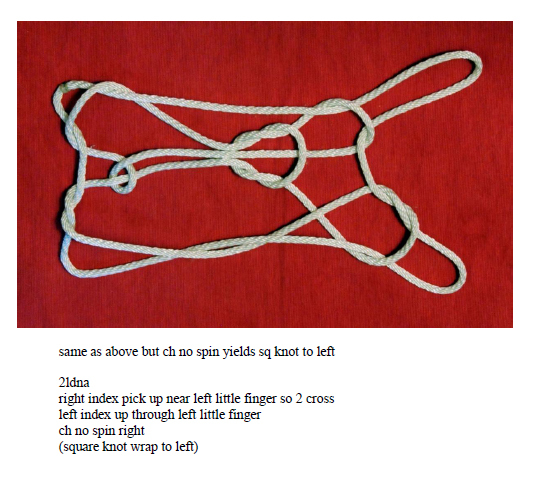 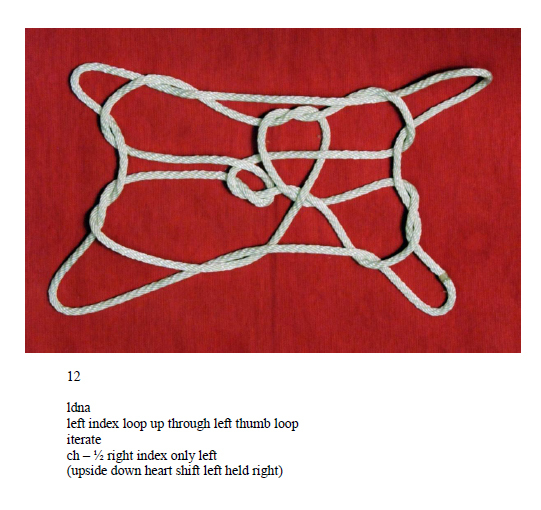 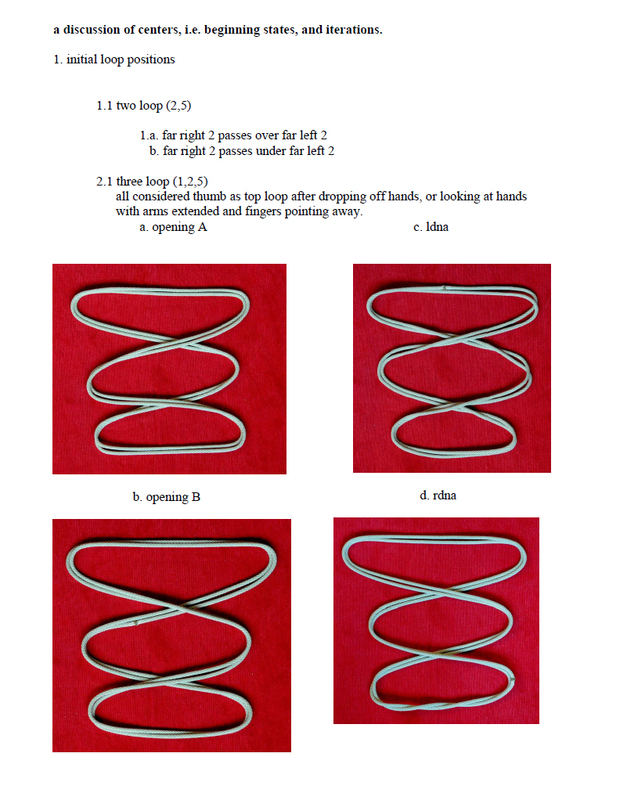 Rotate both index loops -1/2. 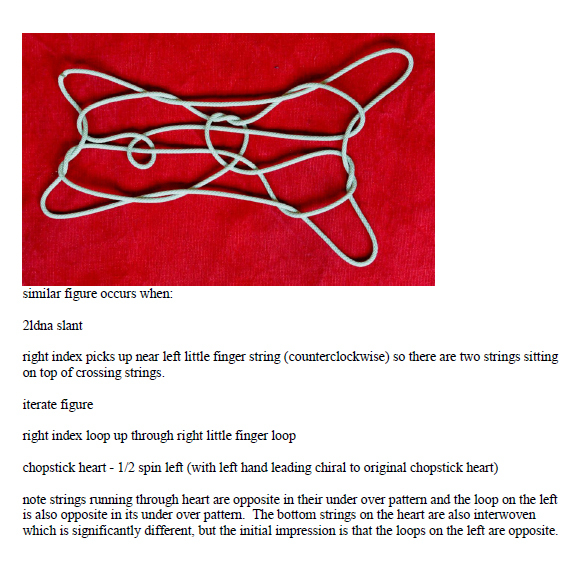 Transfer the right index loop to the top of the left index, inserting the left index from above; insert the right index from the far side and from below into the upper left index loop; pick up the left upper far index string but do not return; pass the right index tip toward you over the left upper near index string, then insert the right index, from above and from the near side, into the left lower index loop. 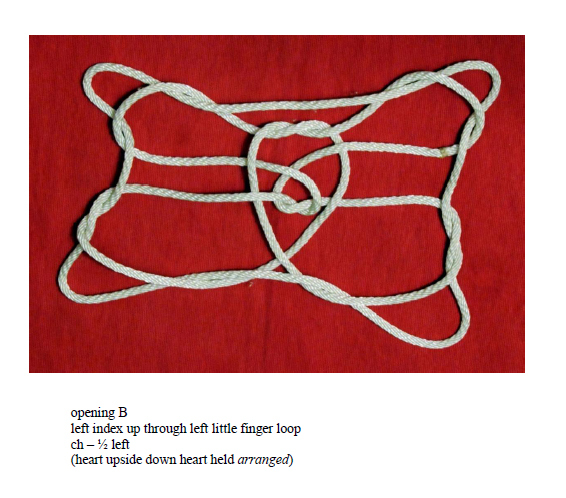 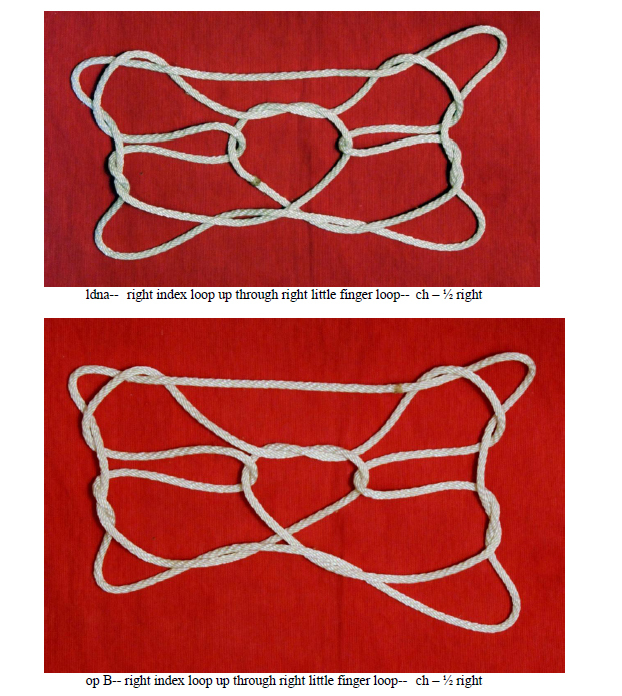 With the right index tip lift the left lower index loop over the left upper index loop and off the left index; Navaho the right index loops (lift the lower loop over the upper loop and release it). 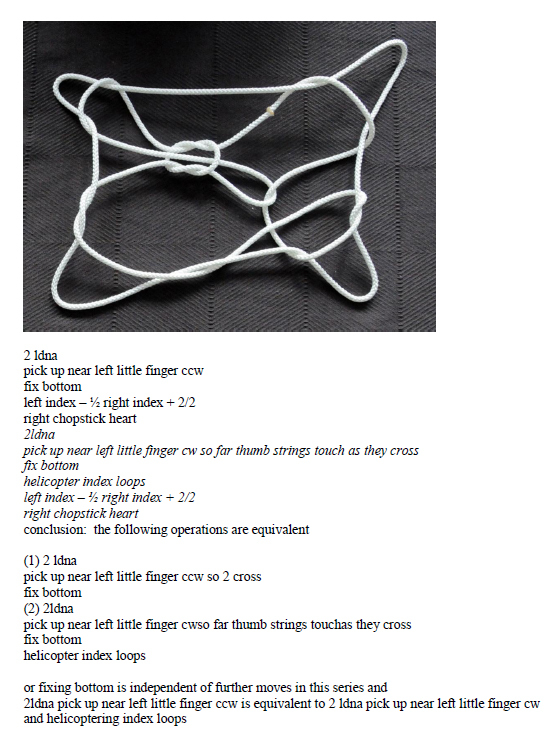 Extend and arrange. 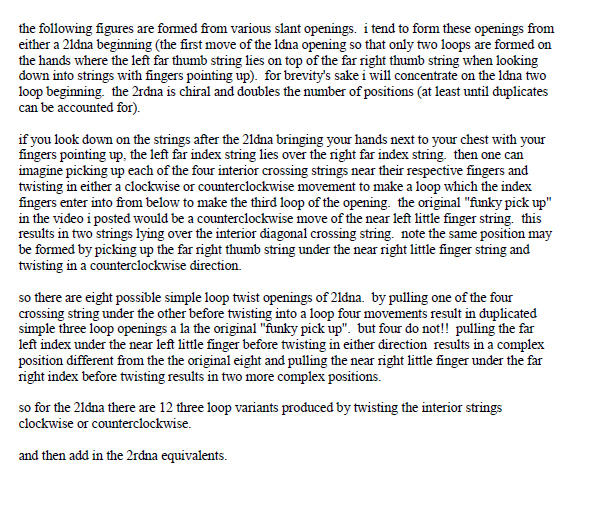 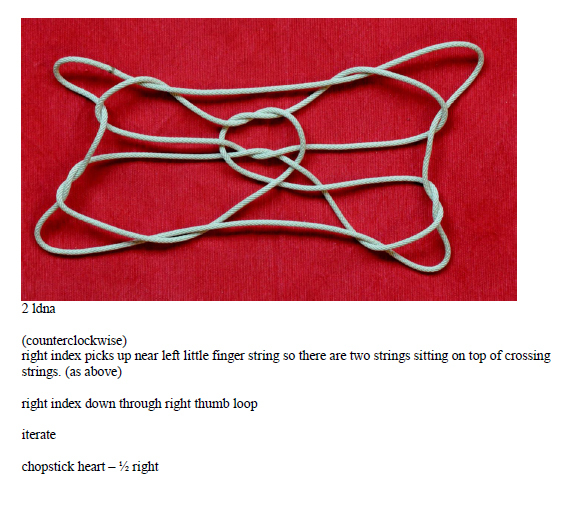 The near index strings should interlock. 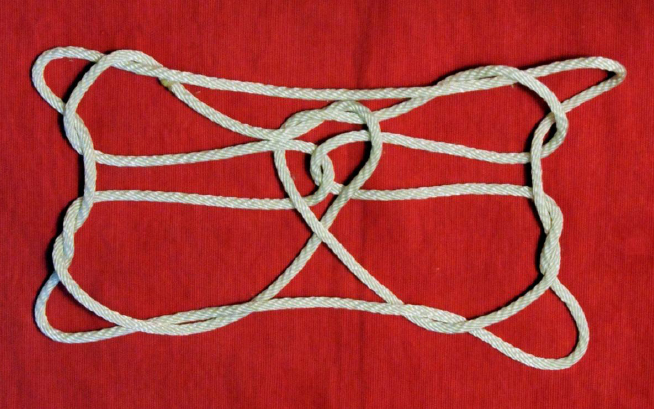 The far index strings coil around each other before entering the center of the design (these strings will form the top of the heart). 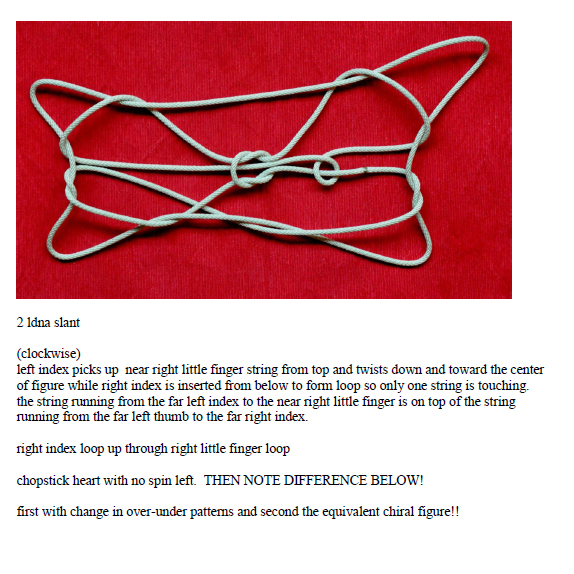 Withdraw the middle finger from the lesser fingers loop and insert it, from below, into the index loop; pinch the near thumb string between the tips of the index and middle fingers, and draw this string through the index-middlefinger loop by rotating the index-middle finger pair away from you and up, thus placing the retrieved string on the back of each index (the index-middle finger loop slips off as you return). 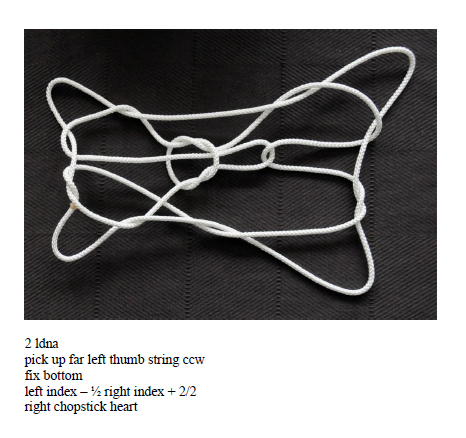 Drop the thumb loop and extend to complete the figure. 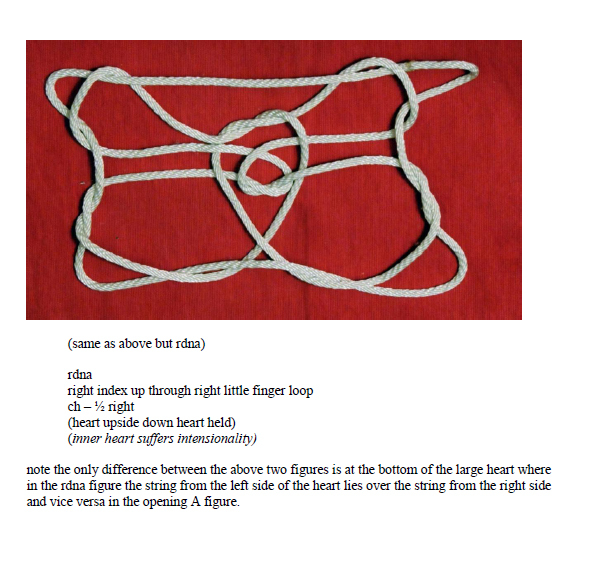 one of the most important aspects of a detailed analysis of these figures is to determine which ones maintain their integrity of form when the figure is stretched taut on the hands. 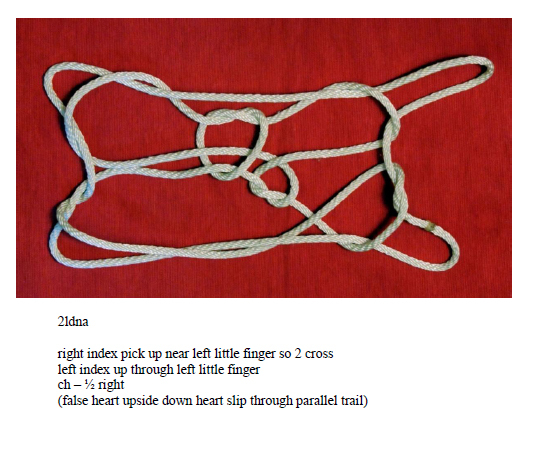 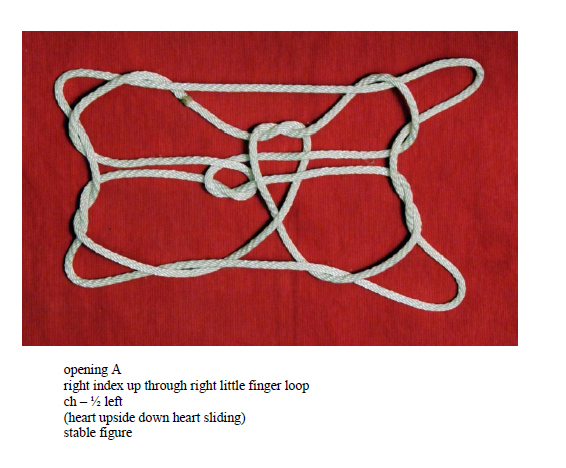 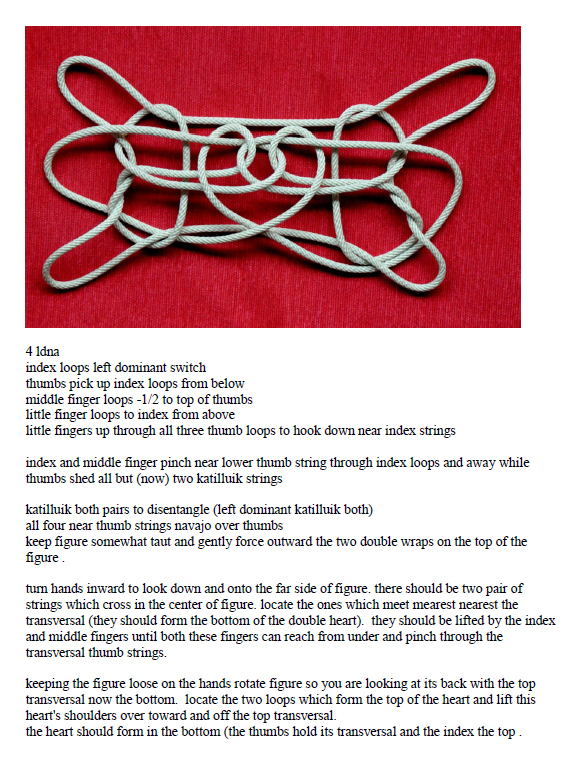 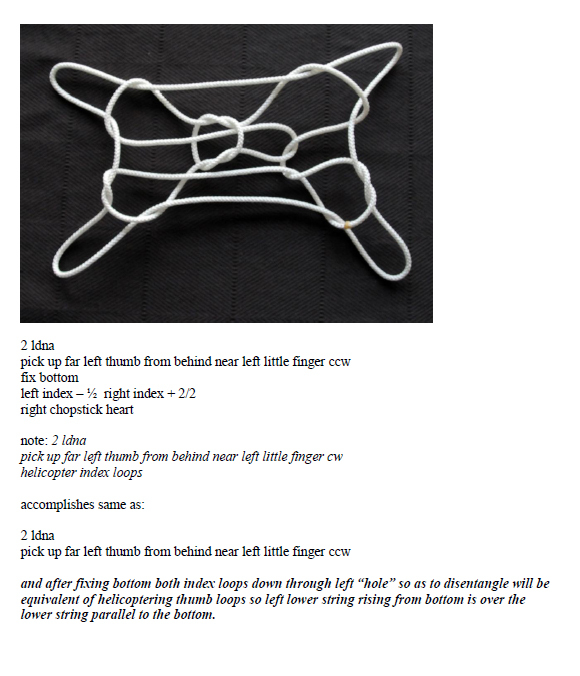 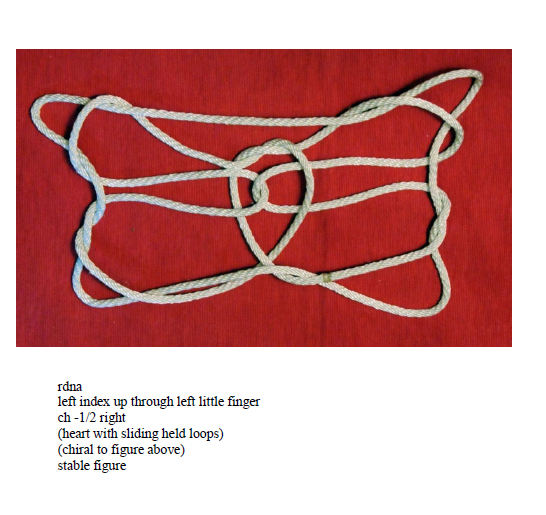 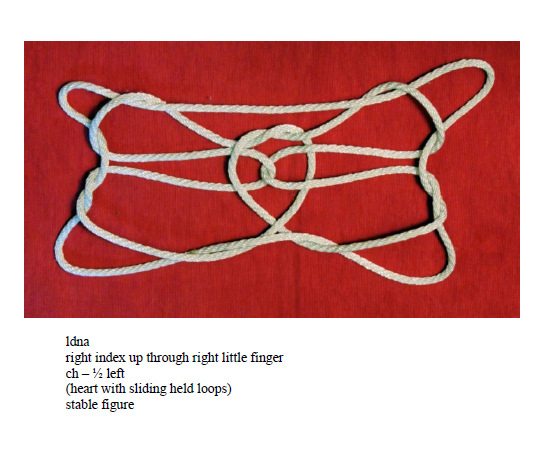 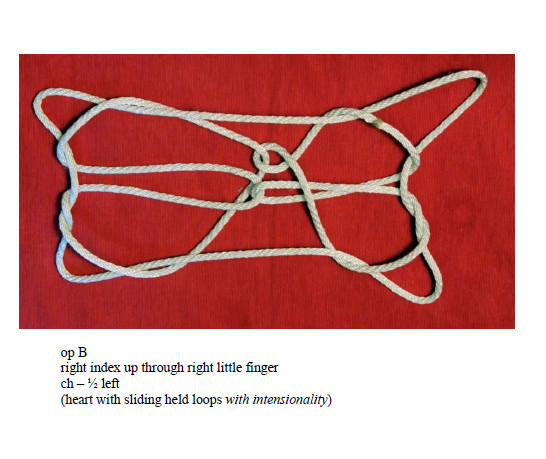 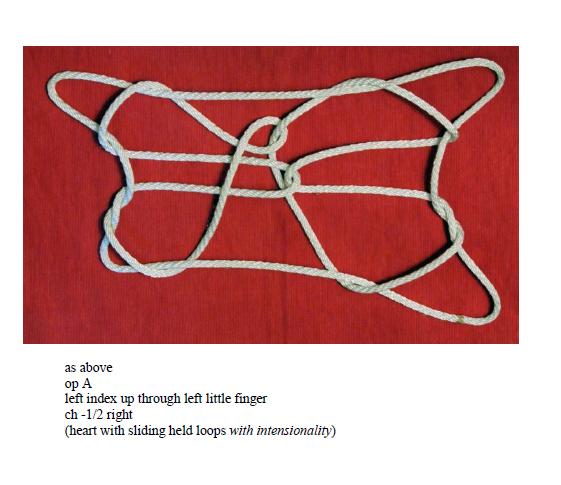 joe ornstein coined the term “intensionality” to describe when a string figure changes its internal form when put under high tension on the hands. 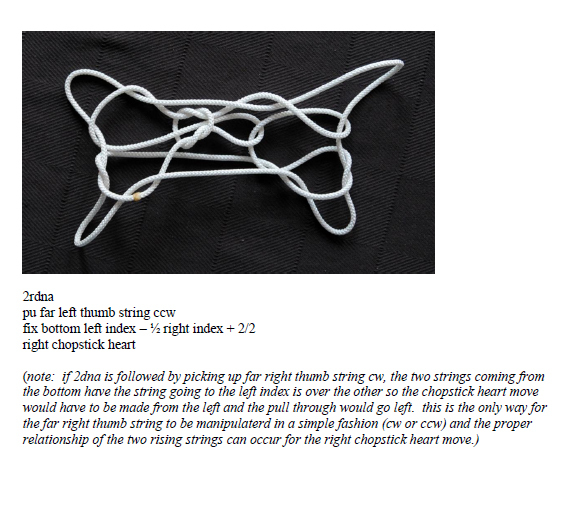 if you were to make the chopstick heart figure above from an ldna opening, chopstick heart – ½ right, the figure would flex into a shape which has no hearts!! 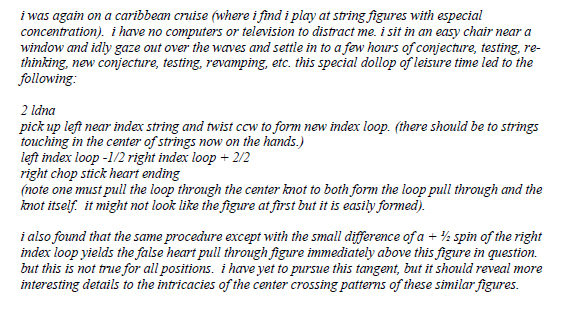 when i first formed the figure this unstable version is what i chanced upon since i habitually started my figures at the time with the ldna opening. 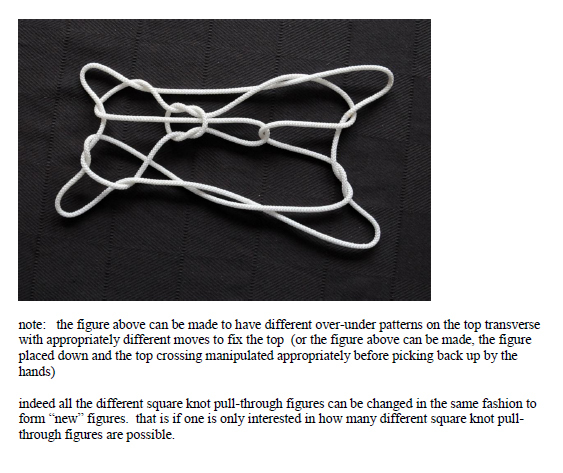 finding this stable form of the figure led me to experiment and find the figures in the balance of this paper. 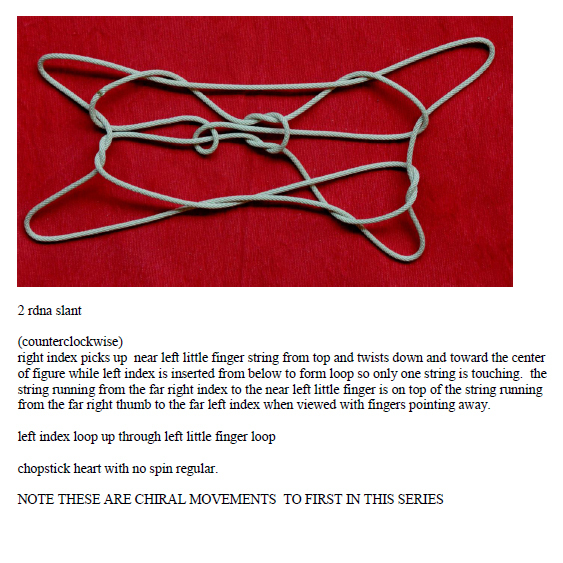 for the record this is the other stable form of the original chopstick heart. 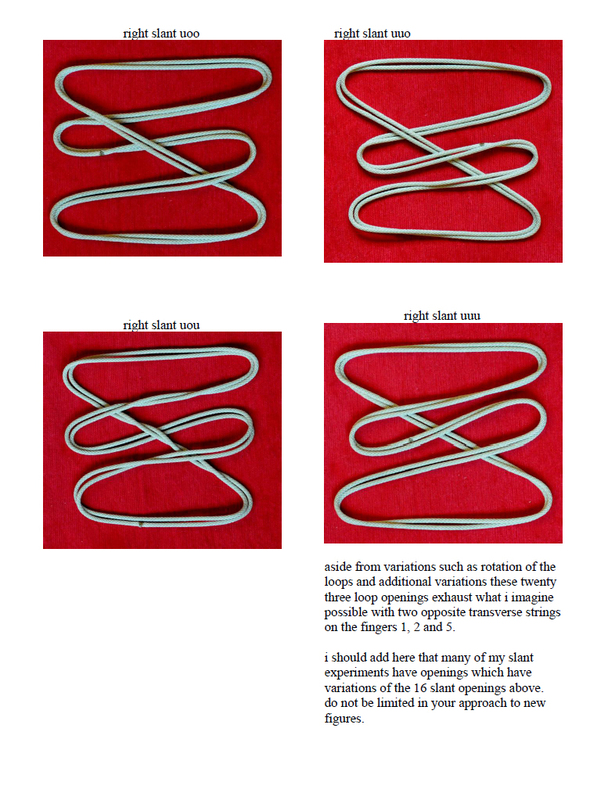 its unstable version can be formed with an rdna opening, all else the same. 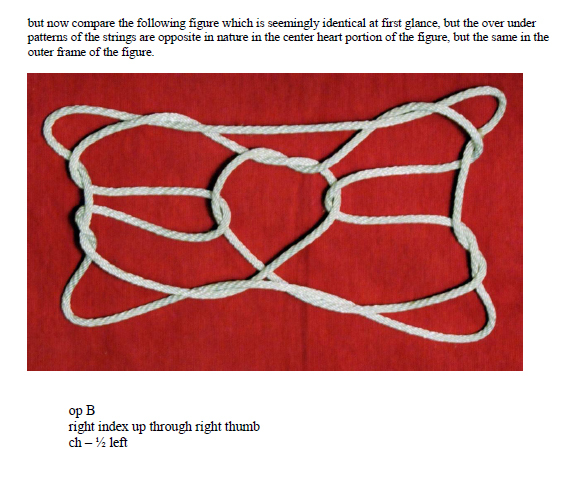 throughout this paper i have not introduced figures which fail to form into interesting final forms (from my perspective). 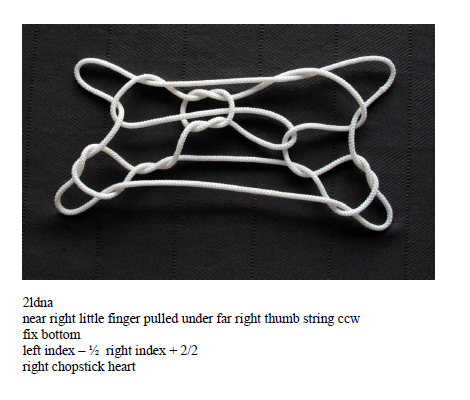 for example the rdna figure chopstick heart – ½ right is to me a degenerate figure, as are a majority of figures formed when experimenting to find new interesting results from fresh concatenations of operations.